Trouble Getting Approved in Georgia? Summary of Georgia Usury Law(s) / Quote: "Legal: 7% Contract: 16%; any rate over $3,000 / Judgment:12% / Corporate: No rate specified"
Legal Maximum Interest Rates: Quote: "7% per year if rate not specified; over seven percent per annum must be in writing; max 16% when the principal is $3K or under; there is no limit on the interest rate if the note is between $3K and $250K, and needs to be "in simple interest" in a written loan agreement as per (§7-4-2)"
Usury Penalties: Quote: "Forfeiture of all interest charged as per (§7-4-10); criminal penalty as per (§7-4-18)"
Judgment Interest Rates: Quote: "Prime rate as per the Fed + three percent as per (§7-4-12)"
Legal Exceptions: Quote: "Small commercial notes as per (§7-3-14)"
Keven from Augusta would like to be approved for a loan of $8000 for him to use to pay a few bills he has and to complete plans he has for his home. He wants to do a few upgrades that include new floors in the kitchen and bathrooms and fix some plumbing issues which are causing the damage to his floors. The leaks have caused the flooring to lift and he thinks there is actually mold under one of the bathroom sinks. His home actually needs a lot of work, but for him right now these are the real priorities. He lives alone and works at a local garage repairing smell engines such as lawnmowers, boat engines and anything that needs repairs. He is very happy with his life and enjoys chatting with his many clients, the neighbors and strangers that drop into the shop. There is nothing that he cannot repair and he also knows pretty much everything that is going on in the area. You also might have guessed that Kevin is going to do most of the repairs himself to save money. A buddy who does a lot of plumbing work is going to give him a hand as well with the plumbing. He may also help with the floors as well. He will stretch this $8000 loan a long ways in terms of repairs he wants to make. Kevin has a problem. He needs this loan, but he has never borrowed any money in the past and he does not have a credit card to his name. He pays cash for almost everything and has always paid things like taxes, utilities etc. on time. Bottom line is that Kevin does not have a credit score and he works for himself. Although he is obviously good with money, living within his means, he has no record for lenders to rely on to determine how risky it might be to approve a loan for him. While Kevin’s circumstances might be unusual, there are lots of people who do not have a credit card and do not have a credit rating. They have done well for themselves and do not pay any interest expense as a result. Never the less there comes a time in almost everyone’s life when they need to borrow money for many different reasons. Kevin is facing that point in his life now. He may have to accept a lien on his property in order to be approved for this loan. Once he has established a credit score it will be far easier to obtain loans in the future should he want one. Given his record, he is quite confident that he will repay this loan early and never miss a payment. He dislikes owing money to anyone and this loan will bother him a great deal until it is fully repaid. However, he really has no choice, he needs to make these repairs to his home and soon. 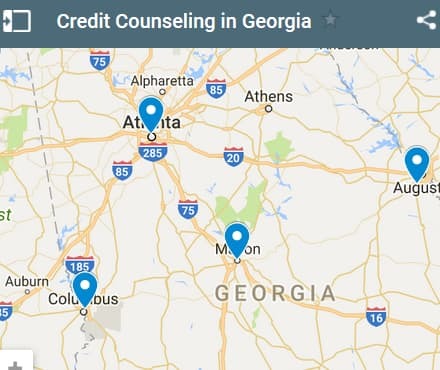 If you live in the State of Georgia and you're struggling with a bad credit rating we hope our website helps you in some way. 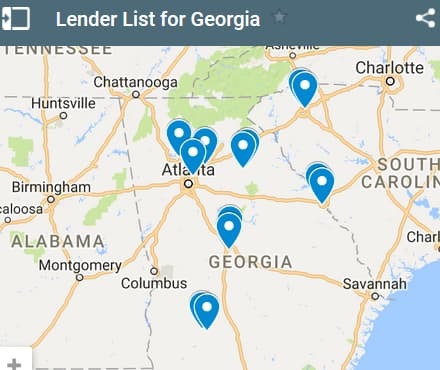 Last 5 debt service loans approved in the State of Georgia. Source: WFL Lender Pool. Updated Weekly. Principals rounded to the nearest $1000. Relative interest rates listed below in order left to right. No matter what at your station of life, you may find yourself in a high debt with high interest rate situation. This is financially crippling and it's even more crippling if your credit score has sunk to rock bottom. And if you don't have any collateral, a cosigner, home equity, some sort of asset, or family member willing to give you an easy loan, you're in a really tough spot. If you don't have a good monthly income, and you're spending habits done change for the better, you may have to employ a debt relief firm to help you with a fresh start. Steve from Macon owes a total of almost $10k to a number of venders, credit cards and even one small loan to his brother. They all want to be paid and with the exception of his brother are threatening some kind of action to recover their money. He really needs a debt consolidation loan so he can get everyone paid. His AC unit quit on him and he had to have it totally replaced. The vender who sold him the unit and installed it obviously wants to be paid. He gave Steve 30 days to pay the debt, which is coming due in another week. If he does not pay, the vender will initiate debt collection on him which he is quite sure will be expensive an unpleasant. His brother loaned him a thousand dollars and although he has not said anything, Steve knows that his brother and his wife are wondering if they will ever see the money paid back. He really wants to pay them and stay on good terms with them. They have helped him so much over the last couple of years and he does not want to ruin his relationship any more than it already is. The credit card companies are actually the easiest to deal with in many ways. It is not personal, they just charge interest on overdue balances and when an account is overdue by a certain number of months, they start collection procedures. They charge a lot of interest and fees for collection so it is very expensive. If Steve could be approved for a $10000 loan he could repay everyone and start afresh. It would also reduce his overall interest costs and he would maintain his credit score. At the moment he has not missed any payments and has not had any reports on his credit account. With a five year term, Steve’s payments will be almost $200 a month which he can afford given his income and other regular payments. He will be able to pay his brother back and he plans to pay his brother a little bit extra to thank him for helping him out. He figures it is the least he can do. They need the money too. The vendor who installed his AC unit will also be repaid and it is a good thing too. Steve figures he will need some more work done for him in a few months and he wants to use the same company. It is a friend of his and he would like to avoid any future issues with him. He will also pay off his credit card debt and avoid paying high interest charges on the unpaid balance. With the loan approved, it is all working out for Steve. He was getting a little stressed about what to do. He can rest easy now and just focus on meeting the terms of this loan. 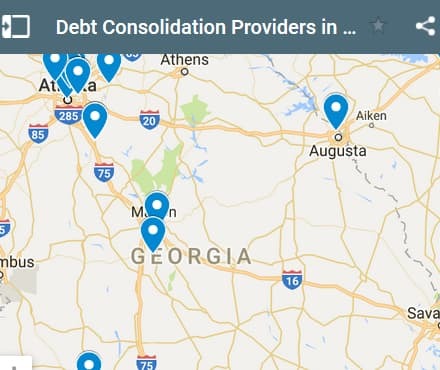 If you live in the State of Georgia and you're trying to get approved for a debt consolidation loan, we hope our website helps you find a good lender and a low interest rate.